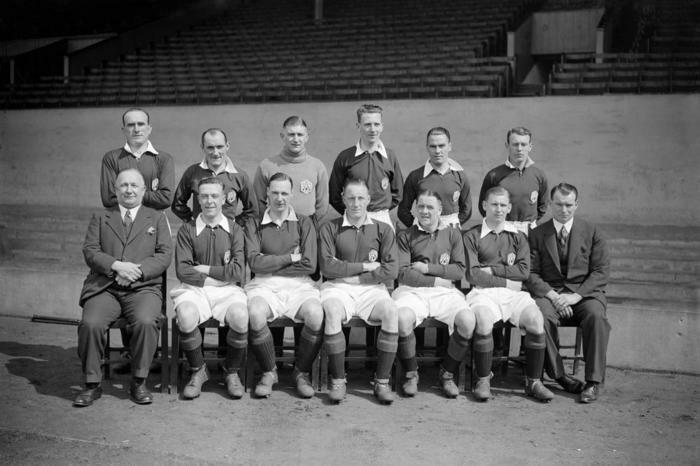 Herbert Chapman (bottom row left) sits alongside his 1932 Arsenal team. Pic by Mirrorpix. Yorkshireman Herbert Chapman is often credited as the great tactical innovator of the 20th century, and is known for his title-winning sides at Huddersfield and Arsenal. The manager transformed the way his teams played, leading English football away from the scrappy, attack-focused style of the Edwardian era to incorporate greater passing and teamwork. In an era when 2-3-5 formations were the norm, Chapman introduced the centre half to mark opposition centre forwards, and encouraged the use of a deep-lying inside forward to link the play between defence and attack, effectively inventing the counter-attack. Chapman wasn’t the only manager experimenting tactically at the time, but his professionalism and vision meant he was the first to turn these ideas into silverware for his teams. After a journeyman playing career as an inside forward, Chapman began his journey in management at Northampton Town. Having won the Southern League Title in 1909, and seen his side play well against First Division sides in the FA Cup, Chapman took the opportunity to manage Second Division Leeds City. The Elland Road side struggled to achieve promotion, but Chapman recruited players that fit his attacking vision; more goals led to bigger crowds, but the outbreak of World War One was to bring league football to a halt. Chapman stepped away from the game, becoming manager of a munitions factory. Herbert Chapman’s legacy was to be built with two previously unfashionable clubs after the war. In 1921, Huddersfield Town tempted him back to the game. It was here that he would demonstrate the importance of a dedicated manager who oversaw all elements of the club; making shrewd signings, imposing his tactics and coaching methods, and working with reserve sides and scouts were all jobs Chapman took on himself. He led Town to their first (and only) FA Cup win in his first full season in charge; consecutive First Division titles were to follow in 1923 & 1924. Chapman’s methods and results were gaining attention across the country. There was growing ambition from London’s clubs; the city was yet to provide a First Division champion – and The Arsenal, at the time a mid-table side with limited support, made a bold move when making Chapman England’s highest-paid football manager in 1925. In return he asked for 5 years to realise his vision for the club. He brought the same single vision to the Highbury team as he had at Huddersfield. In addition to his tactical innovations, he became seen as an advocate for a number of improvements and modernisations in the game: he introduced floodlights to Highbury, had his team wear numbered shirts and even got the local tube station named after the club. Tactically, Chapman’s vision became known as the ‘WM’ formation – a 3-2-2-3 with defenders feeding the ball to wingers who could counter-attack at pace. Again he was happy to make big-money signings: £11,500 was paid for David Jack in 1928; another £8,750 for Preston’s Alex James a year later. But by 1930, Chapman’s well-drilled recruits made good on his promise. Huddersfield had completed a hat-trick of titles after Chapman left, but were beaten 2-0 by his new side in the 1930 FA Cup Final. Arsenal were set up to be the dominant side of the decade. They won the league title in 1931; were league and cup runners-up the following year and regained the title in 1933. 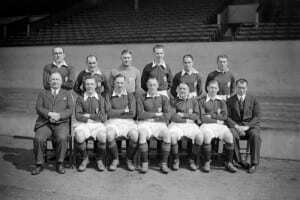 Chapman’s team were mid-way through a run of three successive Division One titles when, after watching a third-team game in early January 1934, 55 year old Chapman succumbed to a bout of pneumonia and died at home. While his career was cut sadly short, Chapman’s legacy is assured. He was inducted to the National Football Museum Hall Of Fame in 2003. He was also one of 5 pioneering figures featured in the 2013 exhibition ‘Game Changers: 125 Years of The Football League’.